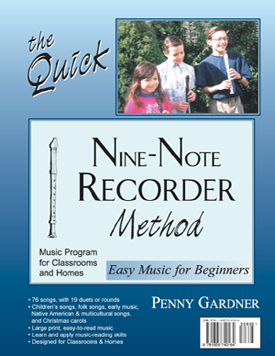 Learn to play soprano recorder with the Quick Nine-Note Recorder Method using only the 9 easiest notes to play and simple rhythms. This abbreviated and inexpensive version, with traditional side binding, features 76 songs, including 19 duets or rounds. Retail: $6.95; website price is $5 plus shipping. Return to Quick Nine-Note Method page.